I like to use broad bean tops in salads – they have a subtle flavour and a fleshy leaf. When you drop them into a steaming broth, they begin to wilt delicately, but retain their freshness – they really don’t need cooking. Chargrilling the spring onions brings a smoky depth to this dish. Start by tearing the chicken carcass into pieces. Chop through any larger bones with a sharp cook’s knife. Put the pieces in a large pan, along with any skin or flavorsome bits from the roasting tin. Set over a medium to high heat and add a dash of olive oil followed by the vegetables, thyme, parsley, bay leaves, peppercorns and coriander seeds. Fry for 4-5 minutes, then cover with about 1.5 litres of cold water. Bring the stock to a gentle simmer. Skim away any surface froth with a large spoon or ladle – this will help to keep the stock clear. Cook, uncovered, for 3-4 hours. You may need to top up the water once or twice during this time. Strain the chicken stock into a bowl through a fine sieve (or a coarse sieve lined with muslin or a clean, thin cotton cloth). Leave to cool, then put in the fridge. When ready to make the broth, pour the stock into a pan (removing any fat from the surface and discarding) and bring to a gentle simmer. Season really well with salt, which will bring the flavours in the stock to life. Heat a griddle pan or plate until hot. Lightly brush the spring onions with oil, and then cook for 1 minute on each side until charred. Put the broad bean tops in a bowl and dress with a squeeze of lemon juice, a pinch of salt and pepper and a trickle of olive oil. 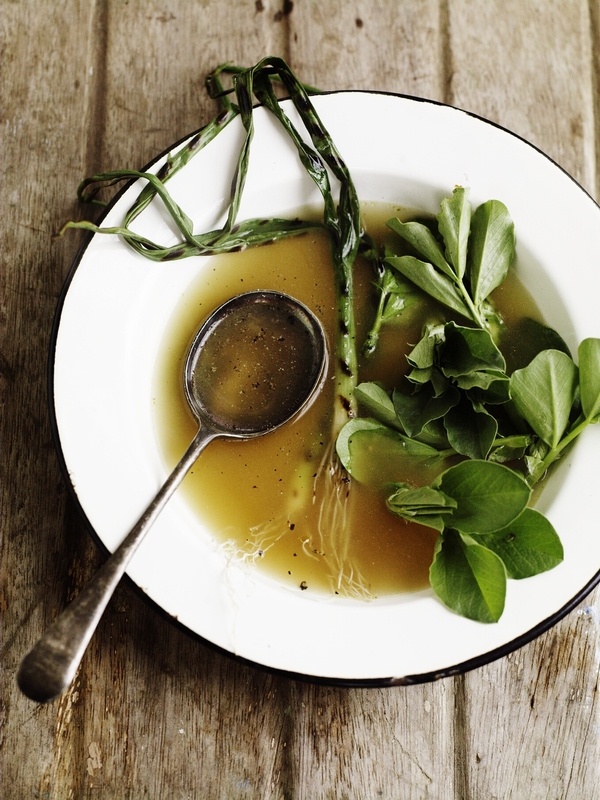 Ladle the hot broth into four warmed bowls, adding a pile of broad bean tops and 2 or 3 spring onions to each one. Serve with extra flaky salt, black pepper and olive oil.